Superior garden flat which benefits from having its own front door and is totally self contained. The double bedroom contains a king sized bed and a single bed (2'6") complete with warm matching duvets and ample wardrobe and drawer space. The large lounge is complete with colour TV, comfortable seating, dining area. It also contains a discrete modern pull down wall bed (4') for 2 additional people. 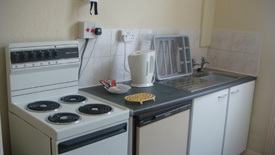 A separate kitchen contains cooker, fridge (with freezer unit), microwave and ample crockery, cutlery, pans and cleaning equipment. A separate bathroom comprises of fabulous large walk-in shower, wash hand basin and toilet. Rear access to enclosed garden / yard area. 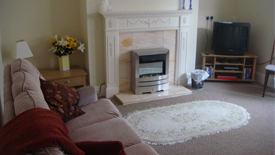 This flat benefits from gas central heating. 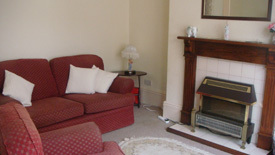 The flat is finished to a very high standard with many home-from-home touches. 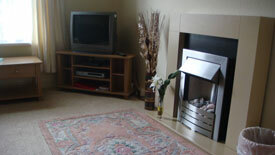 Super ground floor flat furnished to a very high standard. 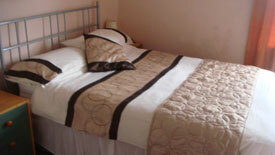 Large double bedroom contains double bed with warm duvet and modern bedroom furniture. Large lounge with colour TV, comfortable seating. Dining area overlooks front of the house with modern kitchen facilities. Separate bathroom contains fabulous walk-in shower, toilet and wash hand basin. Single bed is available for occasional use. Fully self contained first floor flat comprising sunny lounge, double bedroom, en-suite shower room and separate kitchen. The bedroom contains a double bed and single bed (2'6") with ample drawer and wardrobe space and en-suite toilet and shower facilities. The large lounge comprises double bed-settee, reclining leather covered chair, colour TV and dining area overlooking the front of the house. 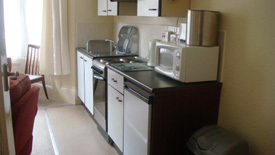 A separate kitchen contains, cooker, fridge (with freezer unit) and microwave. Fully self contained second floor flat comprising sunny lounge, double bedroom, en-suite shower room and separate kitchen. The bedroom contains a double bed with ample drawer and wardrobe space and en-suite toilet and shower facilities. 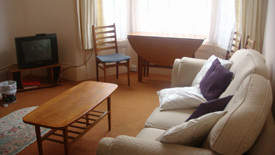 The lounge comprises settee, matching comfy chair and colour TV. 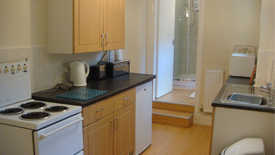 A separate kitchen contains, cooker, fridge (with freezer unit), microwave and dining area.